Key Chain in Black with “I Love ….” Lettering, an “unforgettable gift” for your loved one, which comes from the Heart! Available from us: Keychain, Mousepad, Glass clock and more with “I Love ….” and other motifs. Your desired name is not included in our over 25,000 different names? No problem !, you are welcome to send us your “desired name” or your “wish picture”. 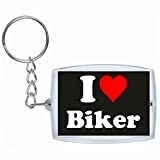 Great “I Love ….” Key pendant made of high quality acrylic plastic which is very robust in everyday use and is not lost by the nickel plated armor chain. The key holder is only 20g with a weight of your car key, key ring, backpack, motorbike key and Many more! Made in Germany, the key chain is a great gift idea for any occasion, whether Christmas or birthday, it is always worth a look! Order now and enchant your partner, friend, relative or yourself a smile on the face.